Match day 9 is over, let's look at all the action from today. 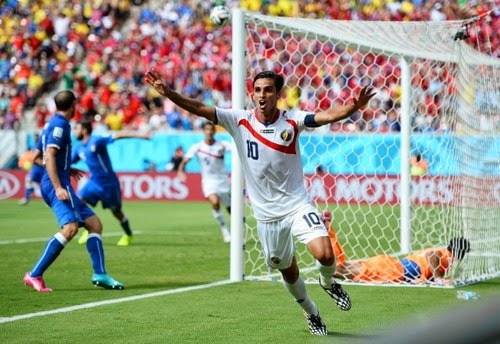 Drawn in a group with Italy, Uruguay and England, the relative minnows of Costa Rica were predicted by many to just be there to make up the numbers. However, after a shocking 3-1 over Uruguay, Los Ticos have gone one better today and knocked off the four time World Champion Italians 1-0. Using quick incisive passing and movement, while denying Pirlo any space to stage Italy's attacks, this wasn't a typical smash and grab win for a small side. Costa Rica genuinely outplayed Italy and were full value for their win. After an up down couple of years at club level, Bryan Ruiz was brilliant again today and his headed goal just before half time was just reward for his terrific play. Despite coming close on several occasions after the break, Italy never got going and not face a crunch match against Uruguay to determine who will join Costa Rica in the Round of 16. England in the meantime are eliminated by virtue of this result. In a score line harking back to the days of Just Fontaine and Raymond Kopa, when they starred for France at the 1958 World Cup, the French proved that their beating of Honduras was no fluke as they powered past the young Swiss side. Five goals from five different players, including one for the red hot Karim Benzema fired France to the top of their group and marked them out as a team to beat in this engaging tournament. Besides Benzema, who also saw a first half penalty saved, Olivier Giroud, Blaise Matuidi, Mathieu Valbuena, and Moussa Sissoko also found the net for the French. There must be something in the air at the Arena Fonte Nova, in Salvador as the three most lopsided matches of the tournament have all taken place there. This result follows on the heels of the Netherlands 5-1 mauling of Spain and Portugal's 4-0 capitulation to Germany at the same venue. One concern for France will be the laxness in their defense that allowed the Swiss to score two late conciliation goals through Blerim Dzemaili and Granit Xhaka. 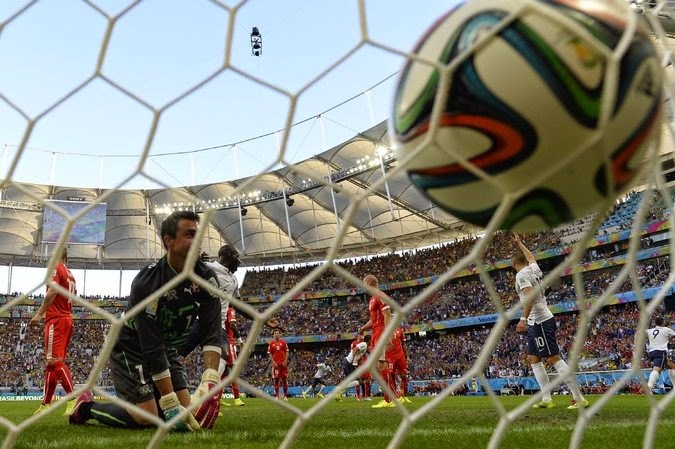 Not since 1982 had Central America's Honduras found the net at the World Cup Finals. Granted they had to wait 28 years between tournament appearances, going scoreless in South Africa at the 2010 Finals was a big disappointment for the Hondurans and not something they wanted to replicate in Brazil. In the 31st minute, veteran striker Carlo Costly finally sent the Honduran fans into dreamland with a terrific goal to vault his team into the lead. Unbowed, the South American's took only three minutes to equalize though, as Enner Valencia reacted quickest as a blocked shot sent the ball skidding across the Honduran box and he knocked it in at the back post. Honduras reacted and nearly equalized before the half, but correctly had a goal chalked off for offside. After the break, Ecuador came out with renewed vigor and eventually found their break through, by that man Enner Valencia again. Watching Manchester United fans were probably left wondering if they could swap their Valencia, Antonio, for compatriot Enner at that point. Despite their efforts to get back into it, there was no further goal for Honduras as they crashed to a defeat. Ecuador now takes on France, still in with a chance to progress to the Round of 16, but they will need to rely on Honduras getting a result against Switzerland as well.